Close to Puerto Vallarta in the center point of the Banderas Bay ( Bay of Flags ) at the Pacific Ocean, Nuevo Vallarta Mexico, a luxury and spacious hotel zone, had been build up during the last 15 years. Nuevo Vallarta, sometimes also called Nuevovallarta, with its long sandy and shelf water beach is situated about 25 minutes north to Puerto Vallarta Downtown, and about 10 minutes to the local Diaz Ordaz airport, in the Mexican state of Nayarit. 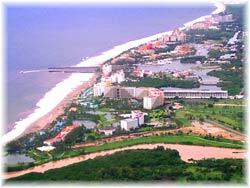 Nuevo Vallarta is the most important travel destination of the so called Riviera Nayarit. Nuevo Vallarta Mexico, is not a city or a village, it is a planned Mexico vacation resort featuring all the modern touristy commodities and some extraordinary attractions, inviting travelers to relax during their vacation in Nuevo Vallarta. The resorts designers goal was, to offer to tourists besides Nayarits nicest beaches, some unique and high level opportunities to make their time in Mexico unforgettable. Along the white three mile long sand beach the traveler finds only upper class hotels, like the Grand Mayan Nuevo Vallarta, the Mayan Palace Nuevo Vallarta or the Allegro Nuevo Vallarta. One of the very special and unique features is the huge 300 slip marina with about 7 miles of shippable water channels. It is like a little Venice at the Mexican pacific coast. Luxury villas, world class golf courses and the spacious beach resorts make it the most modern vacation zone in Mexico and the Banderas bay. The traveler may choose between luxury family vacation in new Mexico tourism facilities and rentable luxury vacation villas in Mexico beach front settings. But also he finds selected options to make his all inclusive honeymoon vacations to Mexico or to book his exceptional luxury Christmas golf vacation in Mexico.